A Korean stir-fried chicken dish, Dak-Galbi is a popular choice for youths and their friends who are looking for an inexpensive and delicious meal. It originated in the city of Chuncheon, Gangwon Province and has a special annual autumn festival dedicated to it since 2005. 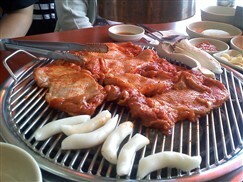 It is also known as Chuncheon Dak-Galbi because of its origin. 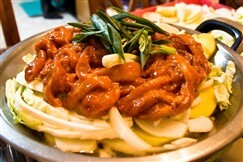 Dak-galbi is especially popular among university students for its affordability and Dak-Galbi restaurants are usually found near universities. Dak-Galbi is made from chicken, soy sauce, garlic, ginger, gochujang, gochujaru, cabbage, onions, sweet potato, perilla leaves and other vegetables. The marinated diced chicken is stir-fried in a gochujang sauce with cabbage, onions, sweet potato, ggaenip, and rice cakes in a hot plate usually at the dining table. It is usually eatenalone as it is quite filling but it can also be served with cooked rice andfresh Kimchi. It is a spicy dish and quite enjoyable during winter. Serve with cold Soju for the ultimate taste experience. Good with a round of drinks, especially later in the evening or when in a tent outside!